My Chitappa (Chachaji) has been with Guruji BKS Iyengar since 1989…. and he has tried in vain to influence everyone in the family to take up yoga except my father. Dad couldn’t go to Pune and learn from the institute but he did learn yoga from another master in Hyderabad and continued practising. When he had his cerebral haemorrhage and was in the hospital, Seenu Chitappa kept saying that we just need him to become conscious – the rest will be done by Guruji. Sadly that was not to be. For Krishnan and I, learning yoga at the Ramamani Iyengar Memorial Yoga Institute (RIMYI) was a bucket list item since 2015. We knew we couldn’t take a month off and go to Pune as long as we were working but as soon as I quit full time work we added this to the list. I love yoga – just that, like everything else, I have been on and off yoga. The shoulder and knee issues that I have been beset with since 2016 made me turn to yoga yet again. While my shoulder and knee situation improved significantly with Rupesh Ji’s classes at home and the Sivananda yoga classes that I attended – I never got back 100%. Similarly, Krishnan’s sciatica and back pain were under control and Dr. Bharat Inder Singh’s exercises and swimming kept him fit, it was still not 100% fitness. We knew that we had to get into the medical class at RIMYI to get back to 100% of our fitness. For me, it was also a dream come true ! We asked Chitappa to help and he got us time in March to go over and attend the Medical classes. We packed our bags and landed up in house in Pune on Feb 28th. Entering the institute for the first time on March 1st was surreal. There is a life size photograph of Guruji as you enter the gate and look up …. it almost feels as though he would just walk out of that picture and we would have definitely got a whack for having delayed coming to the institute for so long !! We met Prashant Ji, Pandu Sir and Kunal besides going up to the first floor to see the hall where a class was underway. I couldn’t take my eyes off the pictures of Guruji in different yoga asanas – I thought to myself, that if I can do any two of the asanas just like him in this lifetime, I would consider myself a success…. but at the end of the month after 12 classes, I reduced that target to one ! His perfection is unbelievable and some of the asanas are in the realm of the improbable. Guruji is definitely Sage Patanjali reborn – there is no other explanation. We missed four classes due to Krishnan’s health scare but managed to do all the other classes. The dedication and commitment of Abhijata (Guruji’s grand daughter) and all the teachers at the institute is commendable and all words of praise fall short. Lynn, Tom, Sindhu, Raya and so many other teachers helped us in getting our poses right and taught us ways of doing them on our own. 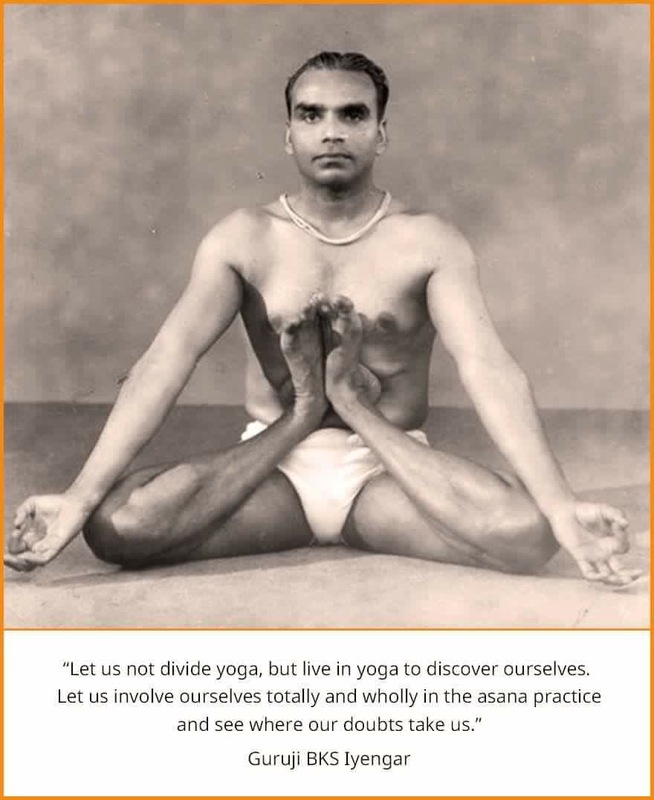 The impact of using the props that Guruji has developed and doing the asanas the Iyengar way is outstanding. After the first class, Krishnan remarked that it felt like he had been swimming for an hour and half for two days. Suddenly after the first couple of classes, the knot in the middle of my shoulders relaxed and consequently some of the stress seemed to melt away and I discovered my neck. We are hooked, nice and proper and so glad that we could learn at the institute. We did buy some props much against Chitappa and Raya’s advise, but with our travelling lifestyle, it helps to have the props handy. A zillion thanks Guruji for giving Yoga back to the world. Seenu Chitappa – thanks for insisting that we come over and learn and for being our source of inspiration. Abhi, Lynn and all the teachers – thanks for teaching us and we will strive to be worthy students.